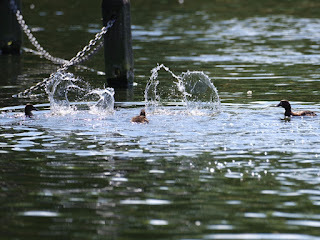 One of the Tufted Duck families was having a mad moment at the island, with four ducklings diving splashily in unison. The Mallard family with two blond ducklings saw someone with a bag of food, and rushed over to take advantage of it. Blondie the Egyptian Goose washed her pale feathers in the shade of the island. Her mate was not with her. Probably she has given up trying to breed this year, after two failures. 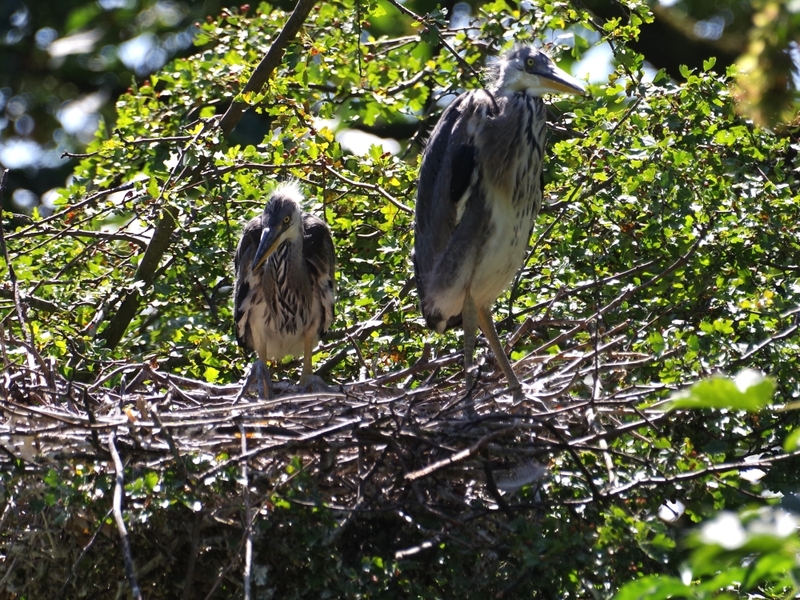 She is a good mother as Egyptians go, but has had bad luck. 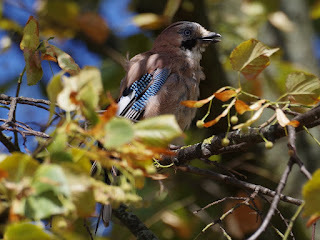 A pair of Bar-Headed Geese had flown over from St James's Park, and preened on the parched grass beside the Round Pond. These beautiful Indian geese now have a small feral population in Britain descended from park escapes. 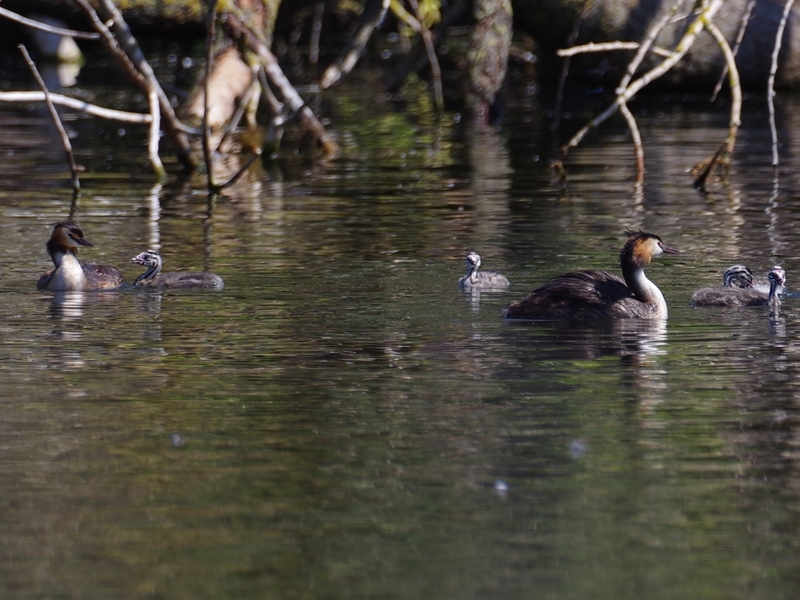 The Great Crested Grebes from the nest in the fallen poplar on the Long Water had all their four chicks in the water. 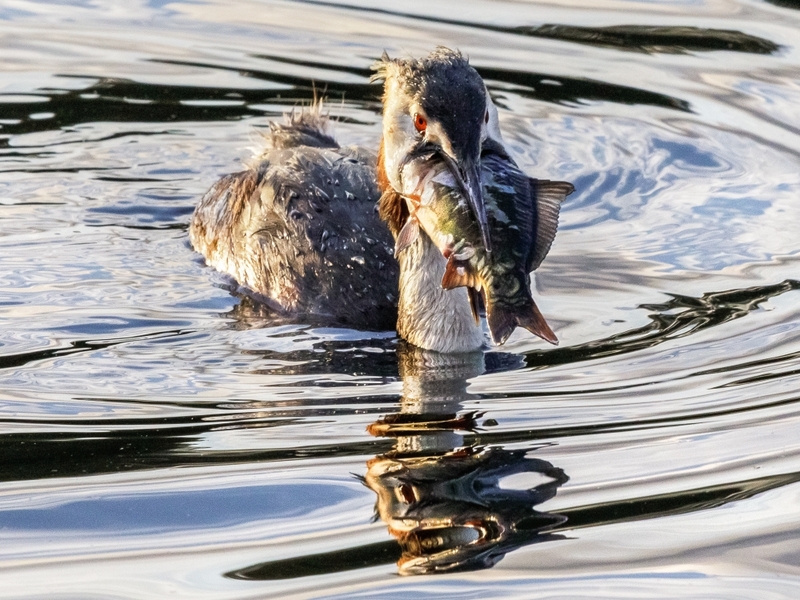 Virginia sent this splendid picture of a grebe which had caught a huge perch. 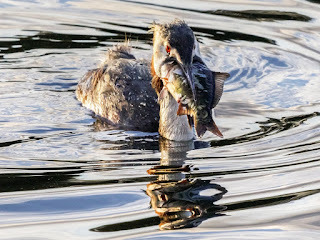 It did eventually manage to swallow the fish. 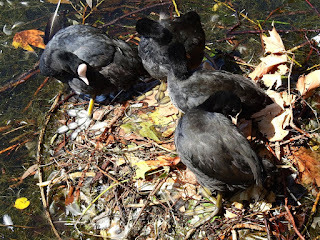 The Coot family under the Dell restaurant balcony are still together on their nest, although the young ones are nearly full grown. 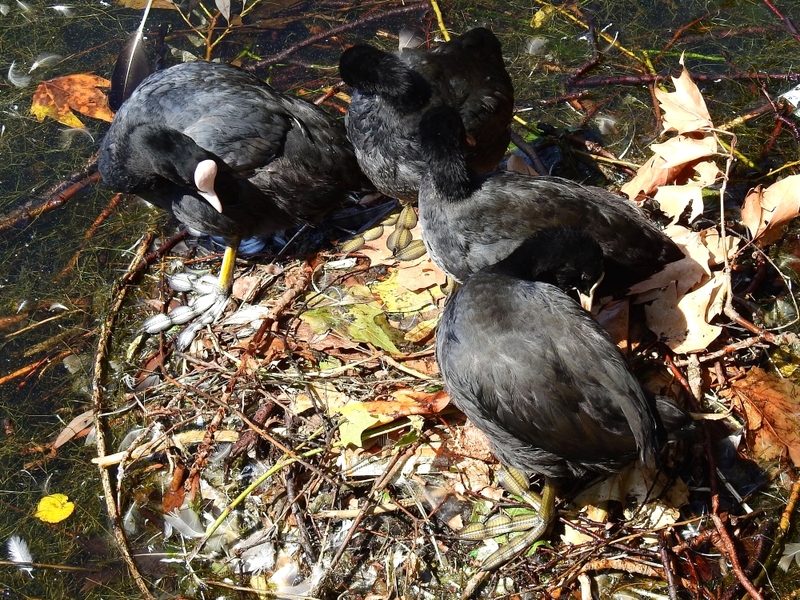 They are clearly proud of their nest, which is a considerable piece of Coot engineering, and reluctant to give it up. But the day will soon come when the young Coots get thrown out and normal hostilities begin. 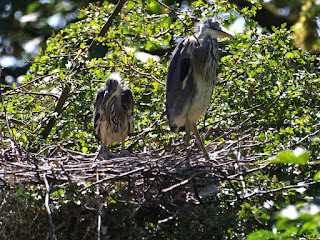 The two young Herons were in their nest by themselves, and stayed quiet. They only start acting up if a parent is with them. 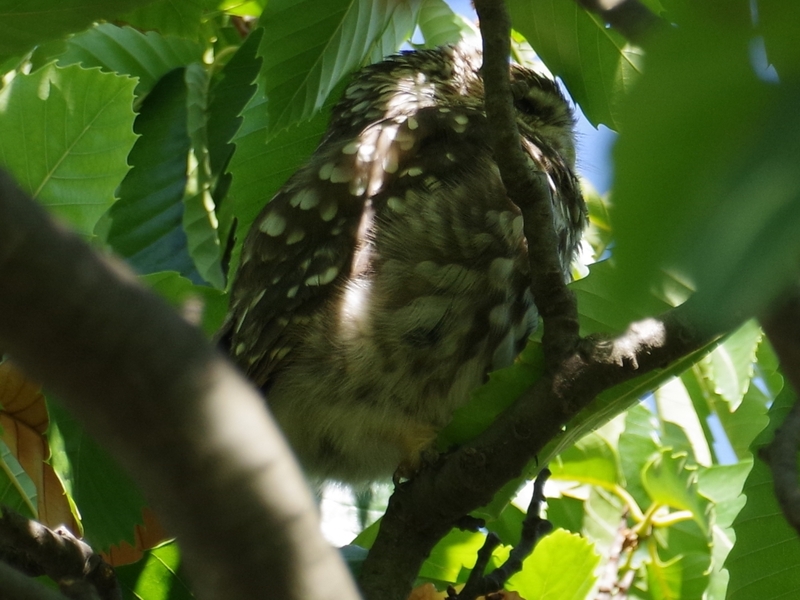 The male Little Owl was hidden in the leaves of chestnut tree, and refused to look down. 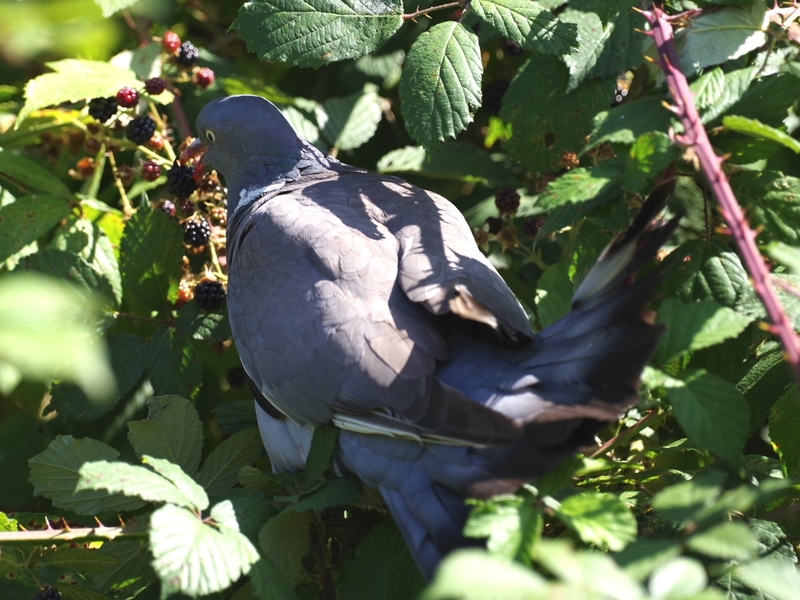 At the owls' nest tree, the next tree down the hill, a Wood Pigeon picked blackberries in the tangle of brambles. 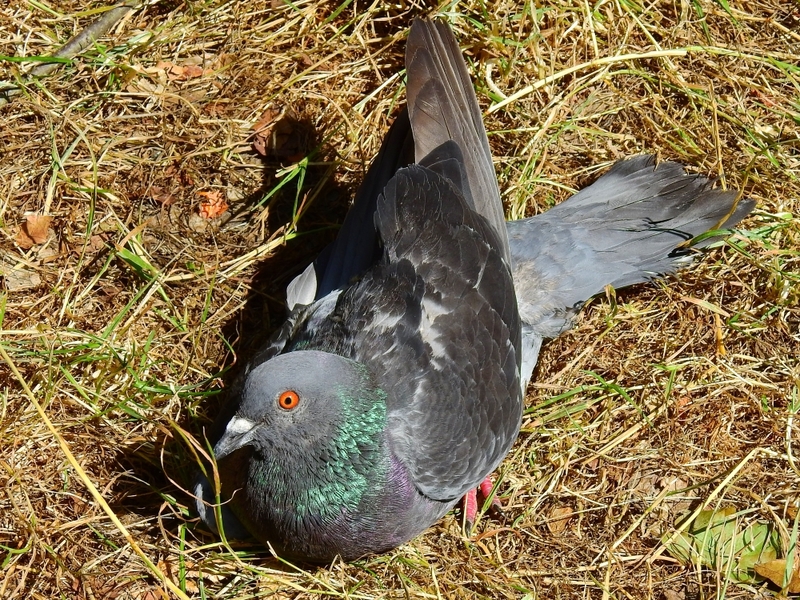 A Feral Pigeon sunbathed on the grass underneath. 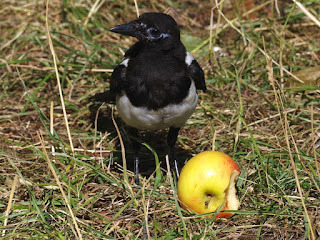 A Magpie found an apple dropped by someone who had been feeding the Rose-Ringed Parakeets. It ws too heavy to pick up, but it managed to tear off a bit and carried it away. It's looking very tatty. The Magpies are moulting now. 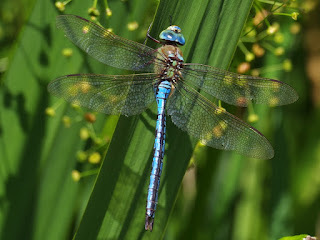 A male Emperor dragonfly rested for some time on an iris leaf in the Italian Garden. 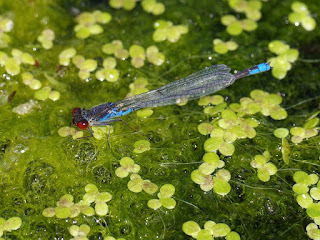 There was a male Small Red-Eyed damselfly on a patch of algae and duckweed in the water below. Poor Magpie. It almost appears to be ashamed of its shabby look, which is not strange considering that they are fashion plates most of the year. 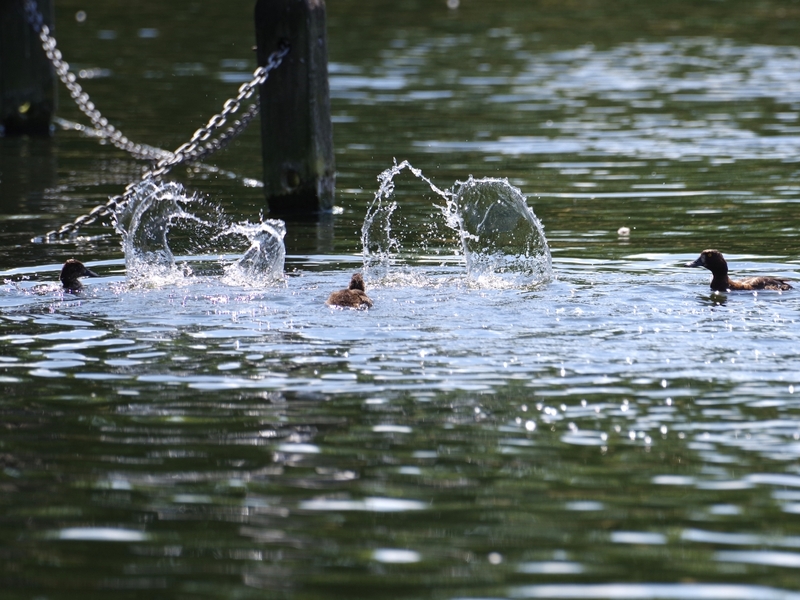 The Tufted Duckings could give the British synchronized swimming team a good run for their money. Now synchronized Tufted swimming is a sport I would be glad to watch on the telly. 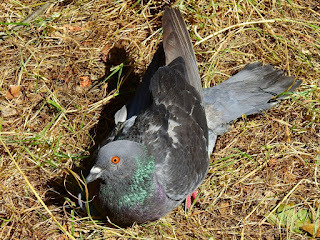 Those Coots have every right to be proud of their building effort. I am sure some famed contemporary architects that shall remain nameless would be incapable of improving on it. The Coots' nest is proving remarkably resistant to having a large Mute Swan frequently squatting on it. I missed the early stages of construction, because it's under the balcony and you have to lean over to see it. But it must have been quite a sight, with the Coots dragging large waterlogged branches heavier than themselves to make its foundations.